They will be here in my Georgia yard, soon, very soon. Back where I used to live, Pittsburgh, you’d see perhaps one Monarch or two in your home garden from May to July. That was exasperating Monarchmama, because those 7 foot tall and 8 foot tall Common milkweed plants were strong, bearing huge flowerheads, all for one or two Monarchs! Twenty or more milkweeds, despondent, waiting for Monarchs, but none come. Here in Georgia, Virginia’s Butterflies & Blooms Briar Patch (as in Br’er Rabbit) Habitat usually has 3 to 4 Monarchs present on any day from April to October. Last November, there was that day when 5 Monarchs arrived in my own garden, together, and they nectared on the Mexican Sunflower (Tithonia) for several hours, before they left, headed to Mexico. They are show headliners, like Johnny Cash, Elvis, the Beatles, Diana Ross, Bing Crosby (my music stopped with the ’60’s). When they fly in, those poor Cloudless Sulphurs, Painted Ladies and Black Swallowtails are abandoned, for Look! a Monarch just flew in!! This male is happily on Tithonia, in that very same Briar Patch Habitat in Eatonton, Georgia. So, I ask you, Why did G-d make the Monarch butterfly? Watching plane loads of people arriving at Ben Gurion International Airport, reminds me that groups visit the HolyLand from every corner of the world. There have been times that I just sit there, waiting for my own flight, and playing a guessing game, Where Are They Arriving From? Chile? Nigeria? Sweden? Taiwan? Azerbizian? Portugal? Iceland? Japan? Myanmar? You? I’ve urged my wingedbeauty friends to visit the HolyLand, sharing maybe 100 posts from there, or more. It’s safe there, very, and starkly beautiful. The dry desert area, buildings built of stone block and the emotional rush of seeing what you imagined back in Sunday school, make for lifelong memories, meaningful memories. If you prefer, luxury hotels abound, as do many other hotels. What I do ask you to think about is driving your rental car out of Tel Aviv, Jerusalem or Eilat, and spending 2 or 3 days in search of what we Love, butterflies. My most beloved destinations are in the north of Israel, the upper Galilee and the Golan Heights. Stay like I do in an SPNI (Society For The Protection of Nature in Israel) guesthouses (reservations must be made in advance) and explore the many nature parks and roadside flora for butterflies. The roads are excellent, and the signs are 98% Hebrew/English. 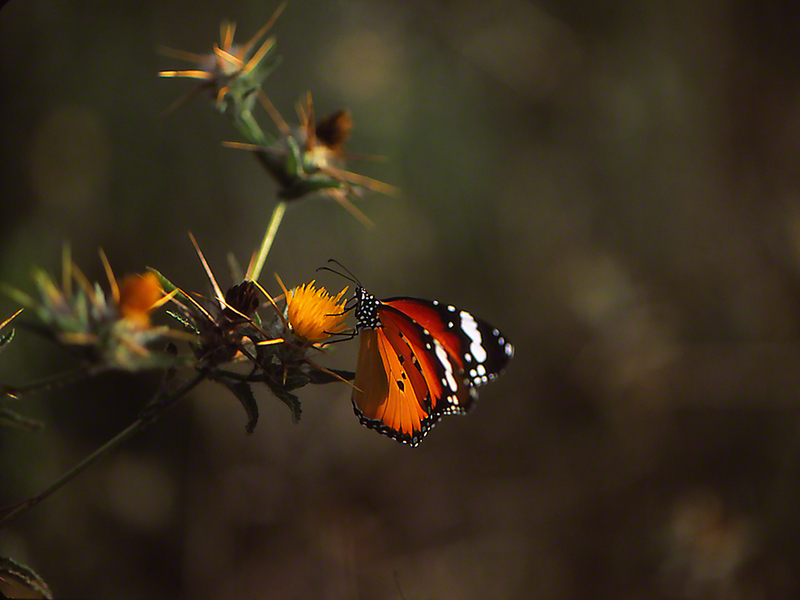 Delight yourself in June/July when you spot this Danaus butterfly, the Plain Tiger butterfly. Just as our Monarchs and Queens do here in the USA, these HolyLand butterflies are milkweed butterflies, laying their egg on milkweed. I’ll reward anyone who takes this suggestion, with an extra special Giant lollypop, made in America. There were three of them on my Tithonia (Mexican Sunflower) that day in December 2018. I spotted them when I approached bed #2 in my now one year old Georgia Piedmont natives garden. A cranial barrage of thoughts exploded in my head when I saw them. A near overload of positive, inspirational, sensual brain transmissions, all instantaneous and all lit by the sight of those three Monarchs. I may have logged more hours in the field than almost all of you. True that when it comes to seeking butterflies. Countless times I’m intent on copping an image of a swallowtail, or a fritillary, or a brushfoot, or a skipper, when from the corner of my eye I spot a Monarch gently flying in. What do you and I do next? We know what we’ve done, time and time again. We politely abandon the butterfly we were working to shoot, and we head over to the Monarch. Monarchs sing a siren’s song, they do. Monarchs love milkweed plants, and bright as we might be, how in the world do their caterpillars consume milkweed, the same milkweed the would gravely sicken us, or the birds that give them a free pass? You cannot ever get a perfect Monarch image. Period. There will always be a better one in your future. Who among us, for example, has shot the best look of a Monarch ‘eye’ ever? I will be beyond Happy to see what you may add to this list, my List. Caron? Leslie? Marcie? Virginia? Melanie? Laura? Barbara Ann? Angela? Sylbie? Beth? Phyllis? Deepthi? Yaron? Phil? Mike? Rose? Cathy? Nancy? Peggy? Hollie? Lisa? Bill? Curt? Debi? Melania? Nancy? Mary? Traci? Terry? Joanne? Jim?